If you’re doing a home repair project in the bathroom or kitchen, chances are you’ll be faced with removing caulk before reapplying a new bead. Sometimes, this preparation is the hardest part of the project. Depending on your situation, your caulk removal task may be easy or it could be challenging. Unfortunately, many of us run into the more challenging scenarios, where removing old caulk doesn’t go as planned, i.e. slip right off with a knife or other sharp edge. The good news is that since this has historically been a frustrating problem for many, a few smart people (such as contractors and manufacturers) have developed easy ways to remove caulk. In this article, we’ll take a look at some of the best ways for caulk removal that professionals use successfully all the time. We’ll cover the tools and products they use as well. These are the ones that work best on all their projects, including circumstances just like yours, such as removing caulk from the tub or kitchen sink. While none of this stuff is considered “secret”, they are definitely tricks of the trade to help you in your own sealant and caulk removal project. Let’s get down to business, and uncover these great solutions. Instead of struggling or having to resort to bruit force, it’s important that you do yourself a favor and get your old sealant ready for removal. Over time, caulk that needs to be removed, hardens and creates what feels like a permanent bond with the surfaces it originally adhered to. It’s not unlike what happens with scotch tape or masking tape. That stuff get’s pretty hard to take off if it’s been there a while! So you need a little help. You need to turn that hardened caulk back into the state it was when it was new. It’s in this state that allows you to remove caulk easily, and in some cases, effortlessly. Some say that placing a warm, wet rag over the old sealant will soften it up after say an hour. While this could work, it’s pretty hard to do this if you have a lot of caulk to remove! What you need is an actual caulk removal solution (a.k.a. solvent, softener or caulk dissolver). The concept is that you put it on the hardened caulk and let is soak in and penetrate. When you come back to remove the caulk (such as scraping), it is MUCH easier. The solution also gets the surface clean and ready for a new application. 3M makes a nice product (see above photo). If you have the time, feel free to leave the solution on over night, or longer if you have a tough case of caulk removal. It may also only take 30 minutes, it just depends. You’ll be thankful you invested a few dollars in this product and gave it the patience to do its thing. No annoying and taxing scraping and possible damage to your fiberglass tub, for example! For a “contractor’s grade” type product, you can also try the effective solvent made by De-Solve-It. It’s pretty strong, and is made for helping to lift off many other adhesives. Once you’ve properly prepared the old caulk for removal, you’re ready to pull it off for good. Now, you could skip the preparation part and go right to this step. Again, it all depends on how severe (i.e. how long the old caulk has been on your surfaces!) your caulk removing job is. 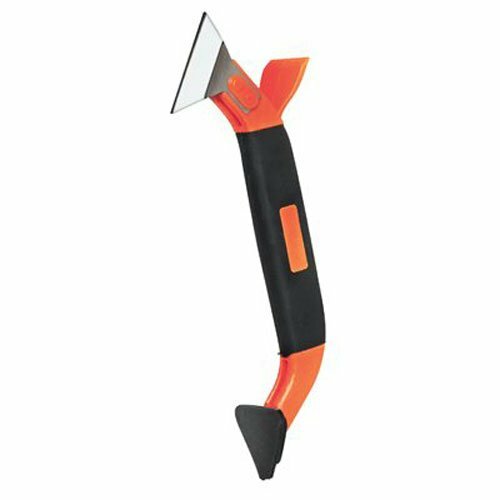 If it’s not too hard, but you’re not able to get it to lift off easily or are worried about scratching tub or tile surfaces, then you should definitely try a caulk removal tool. These tools are made specifically for this job, and will save you time and energy. Having the right tool for the job will only make sense to you when you’re actually in the trenches chiseling away at stubborn old caulk for hours! Razor blades are just too flimsy. You can use a screwdriver or a 5-in-1 painter’s tool, but there is something really nice about a device, a caulk removal tool in this case, that does exactly what it’s supposed to do and doesn’t tax your hand and muscles too much! Allway makes a decent tool that might be worth picking up for difficult jobs (see pic just above). It also doubles as a smoother when applying your new caulking. 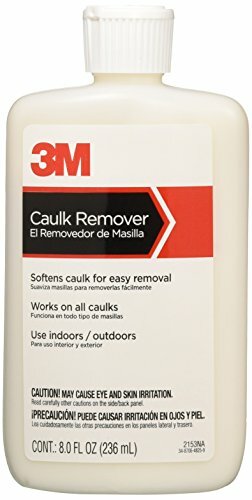 Hey, at the least, investing in this inexpensive tool will help you be more committed to your caulk removing experience (honey-do list in some cases!). You’ll also have a tool to last you forever. Definitely get the model highlighted here since you actually get more for your money with this one since it’s an all-in-one, that comes with a nice finisher tool for when you recaulk. One last step remains…cleaning up appropriately before reapplying a new bead. There really isn’t much to this. The only tips are to ensure that all the caulk you removed is actually gone. You also don’t want to clean it with any heavy amounts of water. You want to keep it as dry as possible. You can probably just use a damp rag and your finger, or a clean, dry rag lightly coated with rubbing alcohol. The alcohol will pick up dirt and any loose residue but dry very quickly. At this point, you should be satisfied at your successful caulk removal endeavor! Let’s say you’re removing caulk from your tub. It’s been on there for who knows what, 10, 20 years. It was hard as rock and only came off in pieces at best, leaving behind still about half of it “concreted” to the tub and wall. So, you applied the caulk remover solution and let it sit a while. When you came back, old caulk was “spongy” in a lot of places. Now, while it came mostly off by pulling on it and running a putty knife under it, there was still some thin lines of it still adhered. Oh, but what a difference from before applying the solution! So you then got out your best caulk removal tool (ok, so it’s your only one, but it’s your favorite now!) and gently scraped along the grooves, going back and forth, where the old caulk was. Voula! The stuff peeled and tore right off. With a smile on your face, you looked at your handy work. You successfully removed caulk from the old tub.